MODEX 2018 in Atlanta, Georgia, starts Monday, April 9 through Thursday April 12. Part of the educational session hosted by Topper Industrial (http://bit.ly/2ib2n1V) will look at the critical role of better utilization of work space. This urgency has never been greater according to the Journal of Commerce which noted that U.S. shippers looking to secure more warehouse and distribution space over the coming years should expect to pay more and have fewer choices. National vacancy rates hit an 18-year low and average rental rates are up ten percent from a year ago in the hottest coastal markets. The national average asking rental price in the first quarter was over $6.25 per square foot. Rental prices have increased steadily each quarter from $4.62 per square foot in the first quarter of 2015. Nationwide, there is little to no industrial product available which means that manufacturing and distribution enterprises must make better use of their existing space. By the end of 2018, almost one billion square feet of space will have been delivered over the previous five years. New construction cannot keep up with demand for industrial real estate. Every sector of warehouse and logistics is contributing to the surging demand for industrial space, with ecommerce contributing the most. Combined with 3PL (third-party logistics) activity linked to online fulfillment, ecommerce represents about 40 percent of the leasing of industrial properties today. While healthy consumer spending and strong ecommerce sales offer one explanation, more manufacturers are looking at the physical floor space needed to drive fork trucks throughout their operation. Fork trucks operate in huge floor space. A tugger pulling ten industrial carts can free up 10 – 50 percent of the current floor space utilization. Smarter space utilization is no longer simply an efficiency calculation; it is a metric of the cost of additional new space (if available). Some voice this situation as learning to make due with current facilities; a lean initiative mandates looking for smarter ways to use the existing footprint. 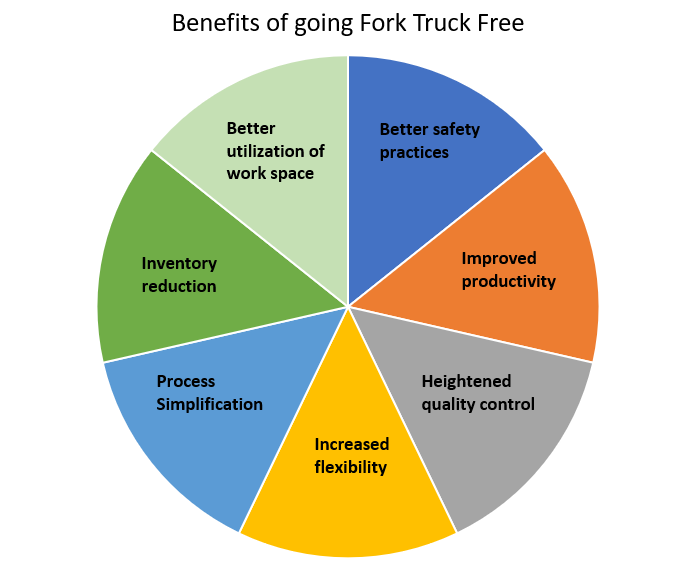 Floorspace capacity can double by eliminating fork trucks; this is a highly cost-effective alternative.